Five JimStoppani.com Challenge winners produced five unique (and challenging) workouts to keep your muscles guessing... and growing. During my last JimStoppani.com Winner’s Weekend, I offered the five JYM Army members – Diane, Lesly, Matt, Stephen, and Steven – yet another challenge: To create their own workouts within specific parameters defined by me. I based this concept off the popular cooking show “Chopped.” And I did it to see how much the five of them have learned in the past months and years as JimStoppani.com members, but also to learn a thing or two from them. Welcome to the JYM! Your challenge, if you accept it, is to create the best whole-body workout possible using the following 9 exercises. You must decide what variation of each movement to use, exercise order, number of sets and reps, and what intensity techniques you’ll use (if any). On Saturday, you must explain the design of the workout to me, what the main goal is, and how the workout is designed to achieve that goal. You must also walk me through a demonstration of all exercises, showing how to perform each one properly. One caveat: None of your exercise variations can be the same, since we’re all going to do the workouts simultaneously at The JYM in Hollywood. So, no duplicate exercises. If we find any that are the same, you’ll have to think on the fly and come up with a unique variation of the movement – the same way you would if training at a crowded gym. Good luck! And if you get stuck, just think “WWJD” – What Would Jim Do? All five winners came up with great workouts, but I only had two trophies to award – one for “Best Program Design” and the other for “Best Exercise Form.” In other words, the best workout designer and the best exercise technician. I’m super proud of both Diane and Matt, as well as the Lesly, Stephen, and Steven. But also, I want everyone else to learn from their workouts – I shouldn’t be the only one you learn from! 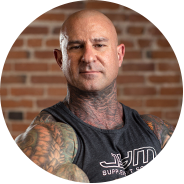 That said, below you’ll find all five JYM Weekend "Chopped" Workouts (you can download them all, too, by using the Jim Stoppani app). Plug these one-off routines into your training whenever you want – on consecutive days, one at a time for “active rest” workouts, whatever you prefer. Hope you enjoy these workouts and learn something from them. And maybe next time Winner’s Weekend in Hollywood rolls around I’ll be asking you for your workout! Exercises with a "+" between them are to be done as supersets. Other exercises (standing calf raise, cable toe raise, seated calf raise) are performed in between superset pairings. *On the third (last) set, do one rest-pause. Exercises with a "+" between them are to be done as supersets. No rest between sets. For each exercise, select a weight with which you can get five reps on all five sets. Rest 2-3 minutes between all sets. *On the last set of each exercise, lighten the weight considerably and perform one last set to failure at around 30 reps.
Decline Bench Press 6 20 sec. Seated Cable Row (close grip) 6 20 sec. Walking Lunge 6 20 sec. Standing Dumbbell Shoulder Press 6 20 sec. Dumbbell Shrug 6 20 sec. Hack Squat 6 20 sec. Standing Overhead Barbell Triceps Extension 6 20 sec. Hammer Curl 6 20 sec. Machine Wrist Curl 6 20 sec. Exercises with a "+" between them are to be done as supersets. *Perform Tabata-style: 20 seconds of reps per set, with only 10 seconds rest in between.